Blueberries are a very popular fruit in the United States because of their unique flavor, small soft edible seeds, and easy use in preparation (Figure 1). Blueberries can be eaten fresh or used to make jelly, jam, pies, pastries, or juice. Blueberry fruit has many healthful properties. It is low in calories and sodium, contains no cholesterol, and is a source of fiber. A major constituent of the fiber is pectin, renowned for its ability to lower blood cholesterol. Blueberries, like blackberries and strawberries, contain measurable quantities of ellagic acid, which has inhibiting effects on chemically induced cancer in laboratory studies. Blueberry juice also contains a compound that prevents bacteria from anchoring to the bladder, thereby helping to prevent urinary tract infections. Last but not least, blueberries have been shown to reduce the effects of glaucoma and improve memory according to reports by the USDA. Refer to the US Highbush Blueberry Council's website for more information: www.blueberry.org. Blueberries are a good fruit crop for home gardens since they require little space and have minimal spray requirements. At present, blueberry plants are not common in home plantings because the plants require very acidic soil conditions in order to grow and thrive. Few backyard soils in Ohio are naturally acidic enough to grow quality blueberries. Therefore, to be a successful grower of blueberries, one must take precautions to check and correct soil acidity before planting. Blueberries grow best in moist, well drained soils with a soil pH between 4.5–5.0 and high organic content. Once the plants are established, the acidity level must be monitored and maintained over the life of the planting. Due to the highly specialized and specific growing conditions, the soil must be amended with organic matter, and the pH must be corrected before proceeding to establish the planting. Refer to the sections in this fact sheet on soil preparation for more information. Bare-rooted blueberry plants begin to produce fruit in the second or third season; however, they do not become fully productive for about six to eight years (Figure 2). Container-grown blueberry plants may be two to three years old and may produce berries during the year of planting. Blueberry plants should not be allowed to bear fruit during the first two years after planting or until the plants reach a height of 2.5 feet. Any blooms that form should be removed. Allowing the plant to produce fruit will reduce growth, resulting in a small plant. Removal of flowers will allow more shoot growth and increase yields in the future years. Once in production, it will be necessary to protect the fruit from hungry birds before it begins changing color. Figure 1. Blueberries, as well as blackberries and strawberries, are not only tasty and nutritious, but also are known to have anti-cancer properties. Photo by Scott Baurer, USDA-ARS. Figure 2. Blueberry plants with ripening berries. Photo by Erik Draper, OSU Extension. There are four types of cultivated blueberries: highbush, half-high or highlow, rabbiteye, and southern highbush. Only highbush blueberry is recommended for Ohio. Rabbiteye and southern highbush blueberries are recommended for the southern United States. Half-high blueberries are better suited for extremely cold winter conditions and may not be as productive as highbush blueberries. There are many good blueberry cultivars available. (Refer to Table 1 for recommended blueberry cultivars in Ohio.) Highbush blueberries do not require two different cultivars for cross pollination purposes. However, bigger berries and higher yields will result from cross pollination, thus it is desirable to plant at least two different cultivars. Using multiple cultivars also allows growers to spread the harvest season and assure good crops if one cultivar has an "off" year, meaning a year with low yields. Table 1. Suggested highbush cultivars of blueberries for Ohio plantings. Bluetta Early Good Medium Fair Vigorous, upright plant. Duke Early-Mid Good Medium Good Vigorous and upright; blooms late to avoid frost. Tolerates fluctuating winter temperatures. Patriot Early-Mid Good Large Good Vigorous and upright; small to medium height; very cold hardy but blooms early. Resistant to root rot. Draper Early-Mid Good Large Excellent Productive, vigorous, and hardy plant. It is a new cultivar. Bluejay Mid Moderate Large Good Mummy berry resistant. Bluecrop Mid Good Large Good, tart Productive, vigorous, hardy plant. Bluegold Mid Good Medium to Large Good Very winter hardy; bushy growth habit; ripening is concentrated. Berkeley Mid Good Large Medium Productive, vigorous and hardy plant. Herbert Late Good Large Excellent Productive, vigorous and hardy plant. Elliott Late Good Medium Good Vigorous and hardy plant and mummy berry resistant. Note: New fruit cultivars that may be superior to currently recommended cultivars are constantly being released. Check with your local Extension Educator or your local nursery to obtain information on newly released cultivars for your area. In general, the climate throughout Ohio is well suited to the production of blueberries. Northern highbush plants can suffer winter injury to flower buds when temperatures drop below -20°F; however, the half-high blueberries will tolerate -35°F to -45°F. Note that half-high blueberries grow only 3 to 4 feet tall so ideally, most of the fruiting area is protected below the snow line in regions with significant snowfall. Blueberries require full sun (six to eight hours of sunlight per day) for optimum yield and quality. They grow best where the soil is very acidic and well supplied with moisture. The soil pH should be in the range of 4.5 to 5.0 and have greater than 3% organic matter. For soils with high loam, clay loam, or clay content, it is strongly suggested that plants be grown on raised beds, 4 feet wide and 9 inches high for better water drainage. Such beds are not needed on sandy soils. It is very important to test soil for pH, lime index (buffer pH), nutrient status, and organic matter content before conducting soil preparation. Refer to OSU Extension fact sheets, HYG-1132, "Soil Testing Is an Excellent Investment for Garden, Lawn, and Landscape Plants, and Commercial Crops" and HYG 1133, "Guidelines for Choosing a Soil Analytical Laboratory" for more information on soil testing, lab selection, and procedures of soil testing. Your soil should be tested twice: once before soil preparation and acidification, and once after sulfur and fertilizer have been added. Further adjustments may then be necessary. Please contact your local Extension office for information on soil testing. Increase soil organic matter by adding organic materials such as peat moss, aged wood chips, or leaf mold or humus. Incorporate the materials into the top 4 to 6 inches at least one year before planting. If the soil pH is above 5.5, apply granular sulfur to lower the soil pH. Refer to Table 2 for general guidelines for the amount of elemental sulfur to apply to 100 square feet of soil to be acidified. Elemental sulfur, also known as soil sulfur, comes in the form of pellets, granules, or powder (Figure 3). The material should be well mixed throughout the top 4 inches of soil three months before planting. Longer periods of time may be necessary if the soil pH is above 6 and the soils contain high levels of calcium. In these cases, sulfur application should be made the year before planting, and the soil should be kept moist but not wet. Soil bacteria convert the sulfur to sulfuric acid in warm, moist conditions during the growing season. This process does not occur during the winter. Wear gloves when handling any form of elemental sulfur. Table 2. Amount of sulfur in pounds per 100 square feet required to lower soil pH for blueberries. Figure 3. Pelletized elemental sulfur can be used as an acidifying agent. Photo by Gary Gao, OSU Extension. Spring is the best time to plant blueberries. Soak the roots of bare-rooted plants in water for an hour before planting. It may be a good idea to prune back the plant by half. This can be accomplished by pruning off smaller shoots and by heading back the main branches. More and more garden centers carry container-grown blueberry plants. These plants have a much bigger root mass, thus have a much better chance of survival and getting established. Be sure to break up the root ball when planting container-grown plants to assure that the plant roots will grow out of the peat medium in the pot and into the soil. Blueberries grow naturally in sandy to loam soil with a pH between 4.5 and 5.2. The soil must be moist yet well-drained throughout the year. Raised beds can be used to provide a well-drained growing site for blueberries. Some growers may choose to tile their garden area to assure proper soil drainage. Blueberries, like other fruit crops, do not like wet feet and must be established in a soil that drains adequately. Blueberries planted on wet sites probably will not survive. Blueberries that are dormant can be planted in the spring. Plants that have broken dormancy and are actively growing (green buds or shoots) should be held in a greenhouse, a garage, or a back porch until after the last average frost date in your area. Remove dormant, bare-root blueberry plants from their shipping container and place them in a bucket of water to soak for about one hour before planting. Mark off the exact location where you will be planting each blueberry bush. Highbush blueberries are commonly spaced 3 to 4 feet apart. Earlier season cultivars can be planted closer while later season cultivars should be further apart. Use a shovel or spade to dig holes approximately two to three times the size of the root system. This will assure adequate space for the root system to fit in the hole and will also allow you to add peat moss and compost as needed. Once a hole is dug, approximately one gallon of peat or sphagnum moss should be added to the planting hole. This medium should be thoroughly mixed with the natural garden soil during the planting process. The root system should be spread out to fill the hole evenly. Position the root crown evenly at the soil surface and backfill with the soil/peat moss mixture. Be careful not to place plants too deep or too shallow. Once planting is complete, water each bush to promote good root-soil contact that will help keep the root system from drying out. When planting a container-grown blueberry bush, gently remove the plant from the pot and lightly roughen up the outside surface of the root ball with a hand pruner. Set the top of the root ball at the existing ground level and backfill around the root ball. It is also critical to cover the exposed roots on top of the root ball with peat-soil mix to avoid excessive water loss. Water the plant thoroughly. Set plants 3 to 4 feet apart with rows 10 feet apart. Apply 4 inches of sawdust or wood chip mulch in a 2 feet wide band after planting, and maintain a 4 inch depth and 4 feet wide band throughout the life of the planting. Fertilizers for blueberry production are best applied using soil test results as a guide. In the year of planting, apply 1/2 to 2/3 pound of ammonium sulfate (or 10 ounces to one pound of 10 10 10) per 100 feet of row about four weeks after planting. Another option is to apply a fertilizer that is designed for acid-loving plants, such as "rhododendron food." Keep the fertilizer at least 6 inches away from the stems of the plant. In the second year and succeeding years, apply 1 to 1.5 pounds of ammonium sulfate (or 2 to 3 pounds of 10 10 10) per 100 feet of row each year for fertility and acidity maintenance. Apply 0.5 pound of the ammonium sulfate at bloom, and the remaining 0.5 pound 4 to 6 weeks later. If the plant leaves become chlorotic, apply 2 to 3 ounces of ferrous sulfate or iron chelate around the base of the plants each year. Fertilizers such as rhododendron food can also be applied during the second and succeeding years if ammonium sulfate is not available. Blueberry bushes have very shallow root systems and are very sensitive to water fluctuations. If water is limited any time while the fruit is forming, berry size and total yield will be adversely affected. The leaves are leathery, and the plants do not wilt when dry, but begin dying a branch at a time. Blueberry plants require at least 1 to 2 inches of water per week. Using a soaker hose is an excellent way to deliver water to blueberry plants. During the growing seasons, supplemental watering is essential to obtain good yields of high-quality fruits. It is important to maintain a moist soil into the late summer after harvest. Flower buds for next year form in late August and September, so drought stress at this time will reduce yields the following year. Much less water is needed in the fall. Make sure the soil is moist but not soaking wet. There is no need to water the plants once the leaves drop in late fall. Blueberry plants normally do not need much pruning for the first three years. Remove small and spindly shoots at planting. Remove blossoms that appear in the year of planting and second year after planting to stimulate vigorous growth. It is important to know the anatomy of a blueberry bush before attempting to prune blueberries (Figure 4). During the fourth year, the dormant plants should be pruned in mid-March. At this time, remove dead and weak branches and thin, terminal wood with small buds. Prune interior crossing branches to admit light to the center of the plant. In the subsequent years, remove a few older branches to force new shoot growth from the crown. The tall growing branches can be headed back, and thin branches removed. Blueberry flower buds are produced at the shoot tips and downwards on last year's shoots. (Figures 5 and 6). Blueberry bushes tend to produce smaller berries when they are overloaded with fruits. Hence, it is important not to have too many flower buds. Figure 4. Diagram of a blueberry bush. Reprinted with permission from the Highbush Blueberry Production Guide, NRAES-55. NRAES, PO Box 4557, Ithaca, New York 14852-4557. www.nraes.org. Figure 5. 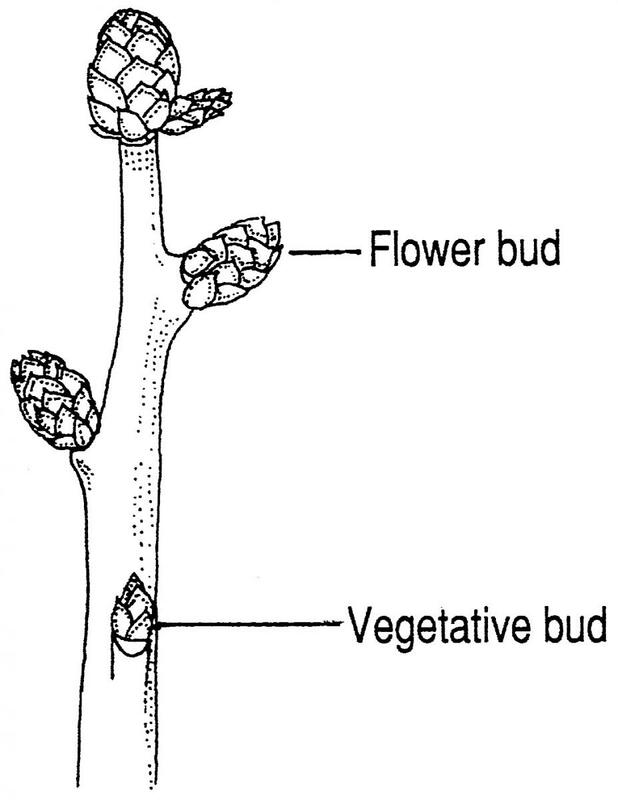 Diagram of a blueberry stem with buds. Reprinted with permission from the Highbush Blueberry Production Guide, NRAES-55. NRAES, PO Box 4557, Ithaca, New York 14852-4557. www.nraes.org. Figure 6. A well pruned "Blue Crop" plant. Please note the good annual growth and abundant flower buds at the tips of the shoots. Photo by Mark Longstroth, MSU Extension. Generous use of mulches such as sawdust, wood chips, or peat moss will help control weeds, conserve moisture, and keep roots cool. Increased organic matter from decomposing mulch will help improve the soil structure and nutrient uptake for the blueberry bush. Replenish the mulch as needed to keep the mulch depth at 2 to 4 inches. When wood chips or sawdust are used as mulch, additional nitrogen will need to be added at the rate of one pound of actual nitrogen per 1,000 square feet of mulched area. Figure 7. Blueberries should only be harvested when they are fully ripe. Photo provided by USDA-ARS. Blueberries do not ripen evenly throughout the cluster and should be picked at least once a week. Only fully mature fruit should be harvested since immature fruit are quite acidic and of poor quality (Figure 7). Immature fruit have a reddish tinge, while ripe fruit are a uniform blue. Fruit do not develop their full flavor when they first become blue, but require one to two days to develop full flavor. Fruit size will continue to increase up to 35% after berries turn blue as water moves into the fruit. Blueberries, unlike some other smal fruit, can remain on the plant for up to 10 days after ripening without a loss in size. Fruit sugar content can be as high as 15% when fully ripe. Fruit flavor and sugar content will not improve after harvest. Thus, the best tasting fruit are obtained if the berries are allowed to ripen fully on the plant; however, the storage life is considerably shorter when berries are fully ripe. Blueberries should be rolled from the cluster with the thumb into the palm of the hand. Fruit should be handled carefully and as little as possible to avoid rubbing off the bloom (the light, waxy finish on the skin) and to reduce bruising that leads to decay. Harvest only when berries are dry. Hands should be placed beneath the clusters to ensure that berries are not dropped. Following harvest, blueberries should not be allowed to remain in the sun. The dark fruit heat up rapidly. At this point, decay is the primary source of berry loss. Anthracnose, gray mold, and Alternaria diseases are the three most common fruit decay organisms. Decay is more of a problem with fruit harvested late in the season when a large percentage of fruit are overripe. The easiest, most effective means of retaining blueberry quality following harvest is to use refrigeration. Low temperatures slow ripening and substantially reduce decay. Blueberries keep best at 32°F and 85% relative humidity. Freshly harvested blueberries will keep for two weeks at 32°F but for only a few days at 70°F. Some potential insect problems in blueberries include blueberry tip borer, plum curculio, blueberry maggot fly, Japanese beetle, cranberry fruit worm, and cherry fruitworm. Disease problems include mummy berry, powdery mildew, twig blights, botrytis blossom blight, leaf spots, phytophthora root rot, and crown gall. However, except for Japanese beetles, none of these diseases or insects are a major problem in Ohio. Birds can be one of the worst pests of blueberries. Netting the bushes may be necessary to prevent losses. For more information about growing blueberries, growers should purchase a copy of the OSU Extension Bulletin 940 "Midwest Home Fruit Production Guide" and Bulletin 780 "Controlling Diseases and Insects in Home Fruit Plantings" from OSU Extension offices across the State of Ohio. Log on to extension.osu.edu for a list of OSU Extension offices and their contact information. OSU Extension bulletins can also be purchased from OSU Extension's eStore 24/7 at estore.osu-extension.org. Gao, G., R. Becker, M. Brown, M. Ellis, S. Prochaska, C. Welty, and R. Williams. OSU Extension Bulletin 940, "Midwest Home Fruit Production Guide." Ward Gauthier, N., C. Kaiser, T. Barnes, C. Smigell, J. Strang, D. Wolfe, S. Wright, P. Byers, K. Demchak, M. Ellis, G. Gao, E. Hanson, R. Isaacs, D. Johnson, and E. Stafne. 2013. University of Kentucky Extension Bulletin, #ID-210. “Midwest Blueberry Production Guide”, Lexington, Kentucky. Welty, C., and M. Ellis. 2010. OSU Extension Bulletin 780, "Controlling Disease and Insects in Home Fruit Plantings." The authors would like to thank Dr. John Strang, Professor and Extension Fruit and Vegetable Specialist with University of Kentucky for reviewing this fact sheet, and the use of blueberry harvest and storage information. Our sincere appreciation goes to Mr. Mark Longstroth, Area Extension Educator, Michigan State University, for reviewing this fact sheet and use of a photo, and Dr. Bruce Bordelon, Professor Horticulture and Landscape Architecture, Purdue University for reviewing this fact sheet.